Namibia is an ancient land with ancient treasures waiting to be discovered. Driving down the C34, in the Skeleton Coast park, we found one of these. 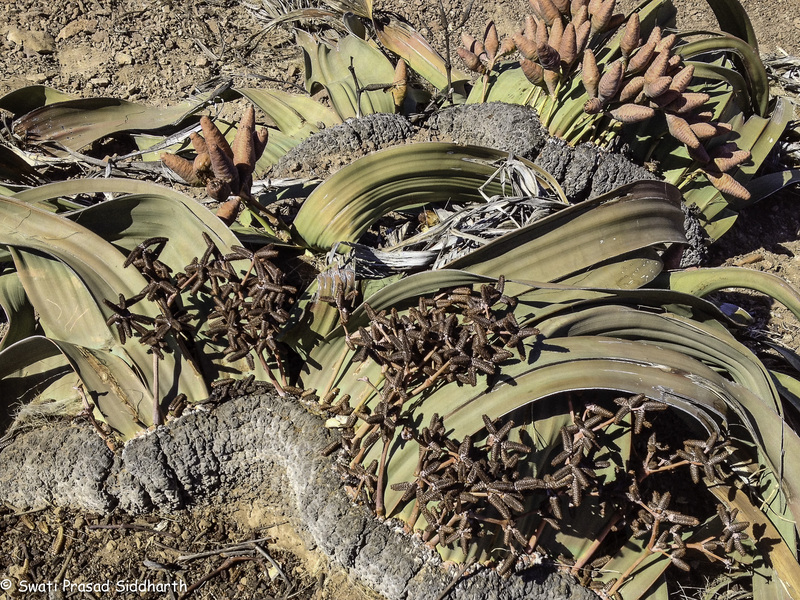 A plant that looks like a heap of rags from the distance, the Welwitschia Mirabilis. is a native of Namibia and Angola. Growing in the harsh, arid landscape of the Namib desert it is a miracle of life. It is a dwarf conifer – classified with cycads and pines, a cone-bearing plant. More interestingly it is thought to be an evolutionary link to flowering plants. Indeed, the link becomes even more magical when one considers that the plants are thought to be at least 1000 and maybe up to 2000 years old. Named after the Austrian botanist Friedrich Welwitsch, this unusual plant is called kharos or khurub in Nama, one of the local languages. Yet, the common name for these centuries-old beings seems the aptest – the living fossil. Since we were officially on a David Rogers photographic safari, we had to get those pictures! While the plant is not tall … the largest is recorded at 2 m in height, the circumference of the plant can grow to 1.5 m. But the spread of the leaves where they touch the sand can extend to 8m! The trunk is rugged and woody, more than half of it being underground. In actual fact, the plant grows only two leaves on opposite sides of the flattish dead looking woody crown (the top of the trunk) – and those two grow all its life long! 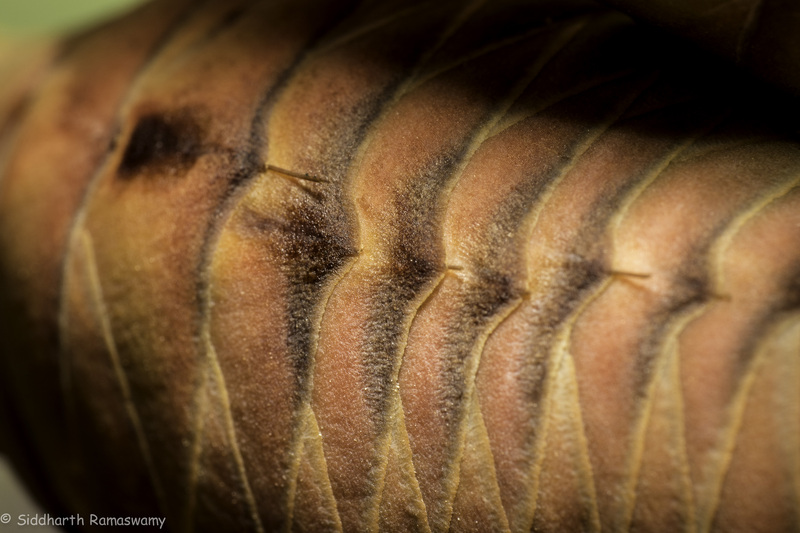 – to between 2 and 4 m. Exposure to the elements and foraging by animals cause it to fray, split and shred. Even if the leaves are eaten away completely, they continue to grow. Closer inspection revealed delicate flowers in a cone-like structure, nestling amongst what looks like a tangle of leaves. The plant gets some of its water from the surface of the sand through lateral roots as well as groundwater through a taproot that can go down 3 m. But a large part of its moisture requirement comes from a more unusual source. The cold Benguela Current of the Atlantic ocean collides with warm air from the Hadley Cell. This creates a fog belt that envelopes parts of the desert. This fog often occurs for more than 180 days a year in the coastal belt. While it has proved to be hazardous to ships, the fog is a vital source of water for desert life! 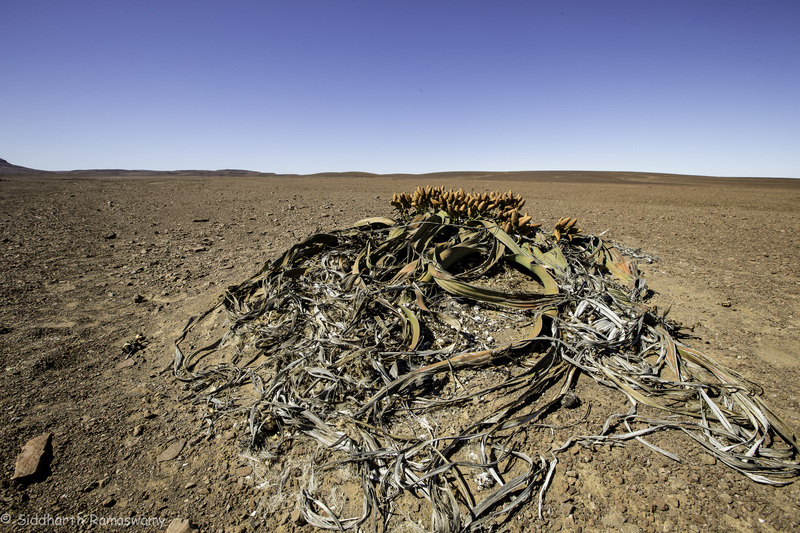 The welwitschia has minute pores in its leaves – estimated at 250 a square millimetre – that absorb condensation from this fog. 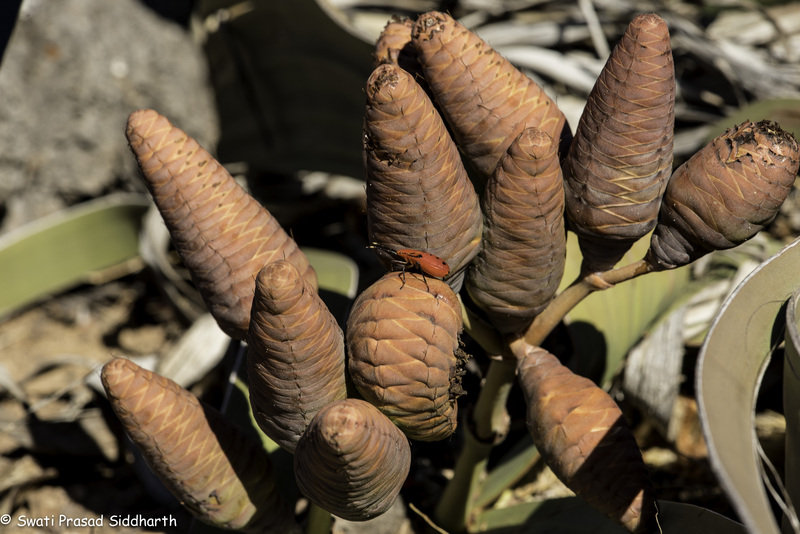 The male and female plants start bearing cones at around 20 years of age. They too grow straight from the trunk. Female cones are larger while male cones are more numerous. 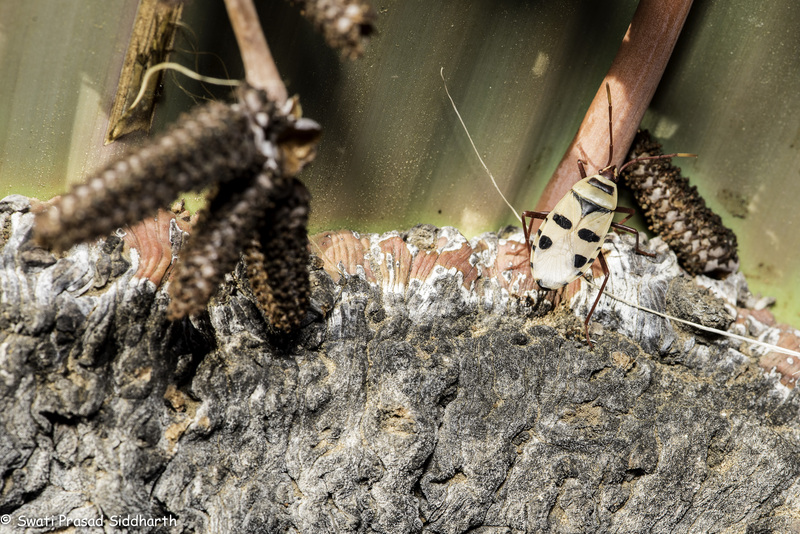 The plants are fertilized by insects – certain flies and “true bugs“. 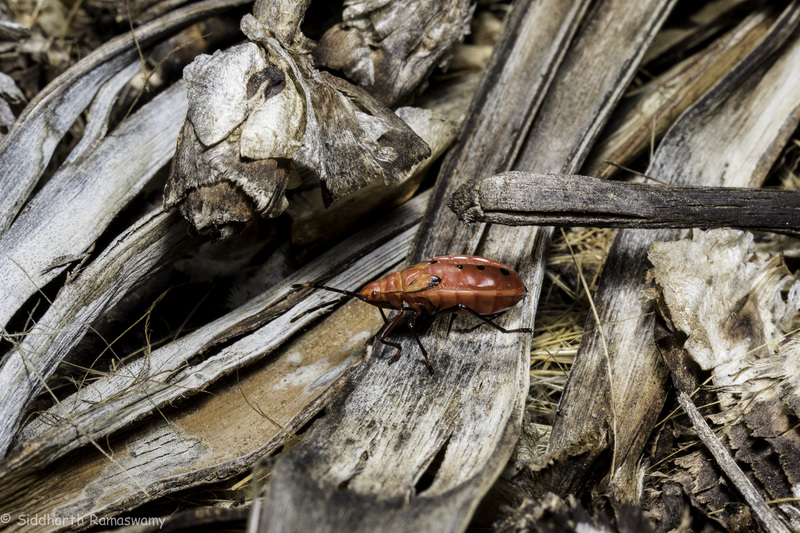 The most common true bugs were readily apparent on the plants. Brilliant red and cream, they were busily scurrying around the flowers, stem and leaves. The pollen and seeds are numerous. 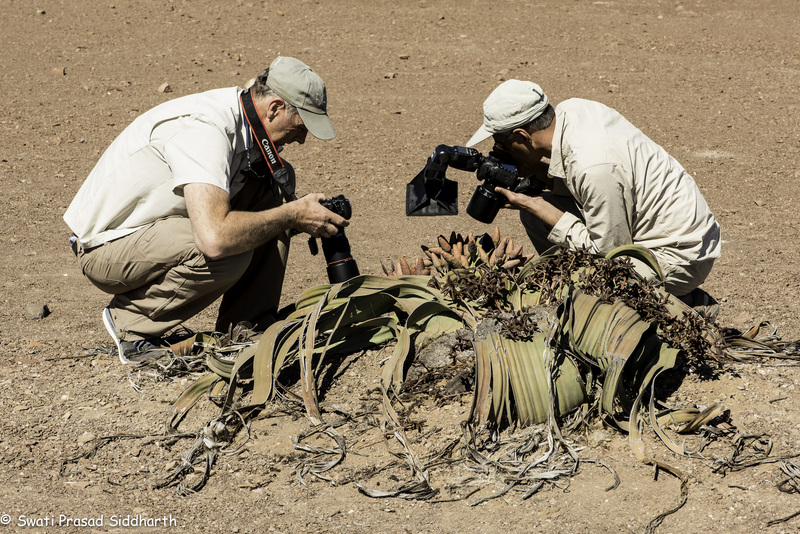 And yet welwitschia are not prolific. Only about one in thousand seeds reach maturity. And once this happens, the seed needs at least 25 mm rain within a few days to germinate! And this, in a land where the annual rainfall in the preceding 10 years has fluctuated wildly between 58mm – 479 mm per year! Wow, that’s an amazing plant! Thank you for sharing the wonders of the desert with us! Another of nature’s adaptations. Wonder how the seeds get germinated? Can’t see any birds or animals doing it. How many of those did you find? Any way the canons seem to be clicking to glory! Thank-you. Africa is fascinating. We are only recording what we experience here! Fascinating write-up, and the accompanying pics! Keep travelling Swati! Meeting a living creature a couple thousand years old is very fascinating! Wow! Super detailed write up !